I have absolutely no problem with the Virginia Flaggers voicing their position at the recent hearing in Charlottesville, Virginia over whether Lee-Jackson Day ought to be continued. However, I do believe that the residents of my former home deserve full disclosure. They ought to know who is coming in from outside the community to shape public policy. They ought to know who is threatening them with the raising of Confederate flags on private property in retaliation. The Virginia Flaggers, including Susan Hathaway, ought to be honest about the people they freely associate with. Over the weekend I shared a story about a billboard that was placed near the Edmund Pettus Bridge by a group calling itself “The Friends of Forrest.” The story about the billboard and the organization has received a good deal of attention over the past few days. The Guardian even sent a reporter to interview Godwin and other members and is definitely worth your time if you can stomach it. So, what is Godwin’s connection to Hathaway and the Virginia Flaggers? Back in 2013 Hathaway expressed her support for Godwin and the group on social media. Hathaway’s support for the group was in connection with its efforts to maintain and improve a monument to Nathan Bedford Forrest in Selma’s Live Oak Cemetery. Hathaway even traveled to meet with Godwin and posed for the photograph above which can be found here. You make the call. What I will suggest is that every public demonstration and every flag raising ceremony organized by Hathaway and the Virginia Flaggers has this baggage attached to it. That is, unless Hathaway is willing to explain her relationship with Godwin and the group. Communities throughout Virginia deserve to know just what “Restore the Honor” means. The Virginia Flaggers and their fellow racists would first have to learn what honor is. They do not possess a shred of honor because they venerate a symbol of racism and tyranny. They know full well what that flag represents and they willfully choose to display it and associate with the groups that do use that flag for a symbol of racism. They lie about American history in a vain attempt to glorify a group of people that chose to secede from the lawful government of the United States of America in order to maintain the institution of slavery. They choose to ignore the facts from the very people they say they glorify and honor in favor of a mythology that makes them feel good about themselves. The Virginia Flaggers are hypocrites. They have no honor whatsoever. I was going to add my own perspective, but instead I’ll just endorse everything that Jimmy said. Imagine if the Virginia Flaggers and the Friends of Forrest had been in Selma in1965. Does anybody doubt which side they would have been on? Commemorating Forrest in Selma seems like an odd choice to me, considering the result of the Battle of Selma. But considering that the bust went up in my lifetime, well, one could easily assume that it has more to do with 1965 than 1865. But considering that the bust went up in my lifetime, well, one could easily assume that it has more to do with 1965 than 1865. Just how Godwin regards the Civil Right Movement shows she is bigoted. The interviewer should have brought up the fact that African Americans were being oppressed in the Jim Crow South even more King was born. If Hathaway isn’t racist, just crazy, then she obviously finds Godwin’s brand of racism insufficiently objectionable to preclude association. I completely agree with the generational point made in your comment. That granite square, in the back of the historical Smitherman museum, whereupon the 2 ladies stand was the former base on which the Forrest Memorial stood when it was dedicated, and when Rose Sanders (wife of Alabama state senator Hank Sanders) was videotaped with her followers trying to pull down the memorial. The Forrest Memorial had been vandalized numerous times. The bust was stolen shortly after Rose and friends made an appeal via their radio program to harm it. The Forrest memorial is now able to sit in a privately owned 1 acre circle in Live Oak Cemetery. Privately owned because of the lawsuit settlement by the City of Selma to the Friends of Forrest and KTK Mining Co. and the UDC due to the violent attacks against Mr Todd Kiskaden and his workers by Rose Sanders and her followers. I proudly support Mr and Mrs Godwin in their decade plus efforts to erect, place, defend and finally restore this memorial to the greatest Cavalry soldier ever seen on this continent. You have made your views crystal clear, Billy. Eric, the fetishization of Forrest has nothing to do with his (considerable) skills as a cavalry soldier. The reason is that he was a slave trader, a murderer of captured black soldiers, and a founder of the KKK. J.E.B. Stuart can’t hold a candle to Forrest when it comes to being the most vicious, inhumane sort of white supremacist. I think that is part of the point that Eric is making. Mr. Levin, when you agree with someone about the civil war, does that mean you agree with them, totally, on everything? Susan does speak of “my good friend Pat Godwin, the legendary Forrest warrior of Selma, AL,” etc. Why do they always think “none exists”? Same in Cville. I saw the interview on Andy’s blog, it was shocking. What gets me is the level of dishonesty. They are literally too afraid to say what they think, that the black race is beneath the white race. Instead they tiptoe around the interviewer’s questions and give him those BS preservation of the white race arguments; much like Connie Chastain’s cultural superiority argument. As Jimmy said, they are liars and cowards. What if the Virginia Flaggers and the Friends of Forrest had been in Selma in1965. Does anybody doubt which side they would have been on? No doubt, whatsoever. They are presently setting themselves up on the opposite side of that current fight and on the opposite side of the memory of that even. Not a good sign when a dog’s ears go up and the eyes focus. As a Mississippian and native Southerner, I am appalled by the actions of this group and other so called “heritage groups” like the flaggers. They do more harm than good to the image and memory of the South. They are a stain on the fabric of our nation and social irritants to us all. 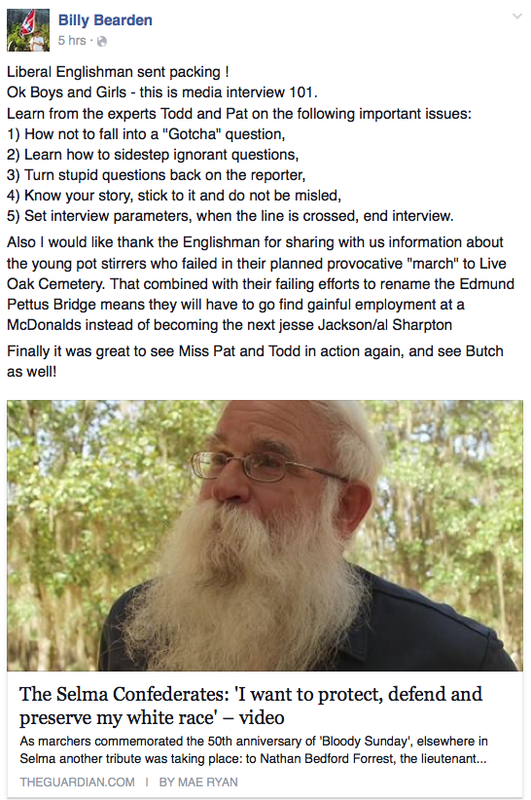 There are ways to honor the bravery of the Southern dead without resorting to this kind of self-serving nonsense. There is no value in being a bigot or intentionally insulting those who marched for civil rights. The timing and placement of the billboard is dubious at best. The bigoted views of Pat Godwin are beyond question. Why anyone who wishes to honor their ancestors would associate with groups like this is beyond my scope to understand. Organizations like “The Friends of Forrest” and the various “flagger” groups are embarrassing and counterproductive. Waving battle flags in downtown Memphis on the day Dr. King was murdered solves NOTHING! This billboard solves NOTHING! 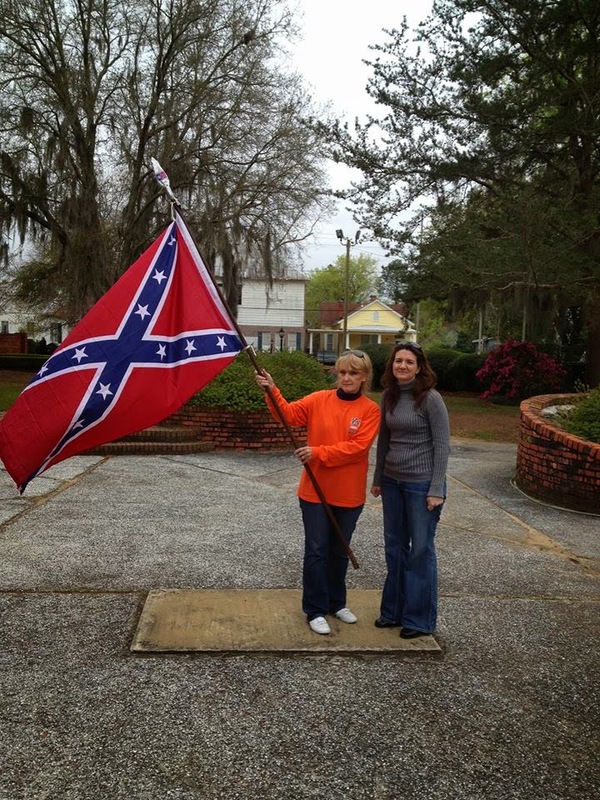 Parading outside a museum of fine arts with Confederate flags solves NOTHING! These groups and their members solve NOTHING! They only create problems.